The two letters attached below - one official, the other informal - were written by His Eminence Philaret to His Eminence Averky, then (in 1970) Igumen of the Holy Trinity Monastery in Jordanville, regarding the service, under Archbishop Averky's auspices, of a Coptic liturgy at the monastery's church. The role of His Eminence Averky in the history of our church is prominent enough, needing no additional aggrandizement. We are not afraid to cast a blemish upon our memories of him by publishing these documents in evidence of his errors. Neither are we seeking to extol Metropolitan Philaret at the expense of his associates. The importance of these letters of His Eminence Philaret, as we see it, lies in the fact that they highlight certain very significant internal problems of our church, which Metropolitan Philaret endeavored to overcome throughout his term as the First Hierarch. Indeed, why would someone with such a strong record of opposition to ecumenism as His Eminence Averky's, rather than some other hierarch with proven liberal views, condone a Coptic service in his church? Why would His Eminence Averky, of all hierarchs, attempt to justify himself by citing the fact that no one observes the canons anymore? He realized perfectly well that the Copts, as members of the Oriental Church, were heretics, and that it was against the canons to let heretics worship in an Orthodox sanctuary, and especially, to join them in their prayers. It is quite obvious that if Catholics rather than Copts had been involved, no heretical liturgy would have been served in Jordanville. How did the differences between the two Hierarchs - Archbishop Averky and Metropolitan Philaret - who were both known for their particularly pious adherence to the Teachings of the Holy Fathers, manifest themselves in this case? It appears that the reason lies in the different perception of what being true to the Tradition of the Church really means. For His Eminence Philaret, it meant adherence to the unadulterated teachings of the Holy Fathers as handed down by them in their writings, in examples taken from their lives, and in the religious commandments they left behind. As for His Eminence Averky, although guided by the same principles, his actions were, to an extent, aligned with relatively recent day-to-day practices of the church, especially from the time preceding the Russian Bolshevik Revolution when, incidentally, the life of the Russian Orthodox Church was in many ways very far removed from the teachings of the Holy Fathers. For instance, Russia was traditionally opposed to the Latin (Catholic) Church, and so was His Eminence Averky. However, in the habitual negation of Catholicism, aversion to the heresy per se was blended with rejection of an alien culture posing a very real threat to the Russian culture. When a heresy unusual and unknown to a Russian entered the scene, to which only the dogmas and canons could serve as guidance, His Eminence Averky's anti-ecumenism crashed down around him. Not only did he let the Copts worship in Jordanville with theological college students praying during their liturgy; in response to those rebuking him he actually claimed that no one observed the canons anymore. His Eminence Averky was the person we would have least expected to come up with this kind of argument. Metropolitan Philaret's stance was both ecclesiastically correct in the true sense of the word hallowed by the Holy Fathers' Teachings, and full of wise foresight. In contrast to the apostatic official, or secularized, Orthodoxy, His Eminence Philaret was always concerned with creating true Orthodox churches upholding the Orthodox Teachings of the Holy Fathers and having no ecclesiastical relations with apostates. In addition to the Russian Church Abroad which harbored exponents of many an ecumenical denomination, this concern of His Eminence Philaret extended to other true Orthodox Churches, especially the Greek Old Calendarists. In this light, the incident of Coptic service in Jordanville was particularly offensive to him. He voiced his fear lest our Church should lose its new children. Today, almost 30 years later, the choice between the dogmatic and canonical purity of Orthodoxy, on one hand, and routine ecclesiastical life, on the other hand, has only become more of a problem for our Church. As all earthly things, the conventional lifestyle of the church will always occasionally come into conflict with our Christian duty. At the moment, external manifestations of church life on either side of the borderline separating MP and ROCA are becoming increasingly similar. Partly due to MP's successful restoration of its ecclesiastical activities, and partly due to the naturally waning numbers of keepers of old traditions within ROCA, MP has been, not unsuccessfully, gaining on the Russian Church Abroad in upholding the Russian Orthodox traditions from before the Bolshevik Revolution. This alone - and it's not the only reason - could give a powerful impetus to the process of mutual recognition by MP and ROCA as two parts of the same Russian Church. If there is anything that's capable of saying a firm no to such recognition it's the dogmas and canons. If we regard dogmas and canons as theory, and golden domes and fascinating stories by Ivan Shmelyov as life, we need to normalize our relations with MP as soon as possible and secure ourselves some kind of environmental niche in World Orthodoxy. 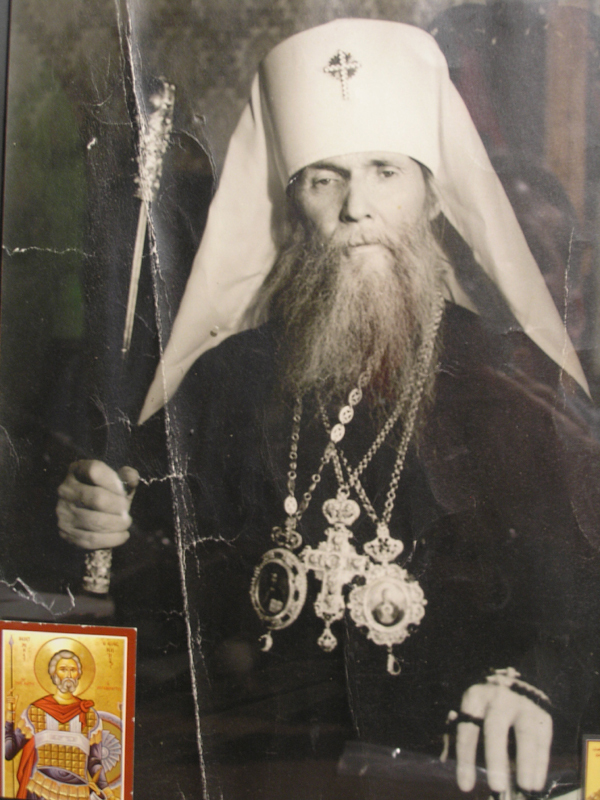 If we regard an Orthodox idyll according to Ivan Shmelyov as no more than a passing weather condition or last year's snowfall, while dogmas and canons, along with other commandments of the Holy Fathers, are words of life, of life eternal, perhaps, there is still hope that we will follow in the footsteps of the eternally memorable Metropolitan Philaret. Both letters are reprinted from photocopies of typewritten originals signed personally by his Eminence Philaret. Early last week, one of the archpriests of our Church advised me that a Coptic (i.e. Monophysite, heretical) service had been administered at the lower church of the Holy Trinity Cloister. 1. Consecrate the lower church with holy water and read an appropriate prayer suitable for reading in a church defiled by the presence of heretics (The Book of Prayer, Chapter 40 or 41). 2. Until the above is accomplished, all worship and praying in the lower church must be stopped forthwith. Please, find attached my official memorandum to you. I would also like to comment on your letter to me which I have just received. Let me start from the beginning. Last Monday or Tuesday I received a telephone call from one of our archpriests advising that a Coptic (i.e. Monophysite) service had been held at the lower church of the Holy Trinity Cloister. These tidings were hard to believe, and I expressed my doubts. The caller assured me that his source was absolutely reliable and that he did not have the slightest doubt that this information was true. I promised that I would verify this, and proceeded to seek your information. Vladika. Laurus was going to teach classes at the seminary on Wednesday, so I asked him to try and find out about it, too. He agreed, but when he came back, he would not tell me anything. As he was obviously trying to avoid this matter, I never mentioned it again, waiting for a reply from Your Eminence. I have received your reply today. In the days preceding it, I was advised of the Coptic service by different parties in all manner of ways. I have also heard various arguments in support of this fact, and they are going to be the subject of this letter. Monophysites who maintain that our Savior was of one nature only, the Divine nature, as his human nature had allegedly vanished or dispersed without a trace in His Divine nature like a tiny drop in an endless sea. Given this state of things, is not a Coptic or Monophysite liturgy but a piece of non-representational nonsense without any real substance or meaning? Indeed, the subject-matter of the mystery of the Eucharist are the Divine Flesh and Blood of Christ - the Flesh that suffered for us, and the Blood that was shed for us. Yet the Flesh and the Blood are appurtenances of the human nature of our Savior: God can neither suffer nor die. If the Monophysites completely deny the human nature of our Savior, what meaning can their liturgy possibly have? Verily their Eucharist is of the kind that our Holy Fathers bluntly referred to as demons' food. Think what you may, Your Eminence, but I would never allow this blasphemous nonsense in the church or on any other premises. Eyewitnesses have categorically testified that our theology students bowed (albeit not to the ground) to the Coptic elevation. We cannot deny that such bowing is a manifestation of religious reverence and that, therefore, there occurred a form of complicity in what was going on, namely, in the prayers of heretics. You know how merciless the holy canons are when it comes to participating in heretical services. The canons that deal with this are the strictest. Thus the Church resolutely safeguards itself against any form of communion with those outside its domain. That's where the Copts are, too. No matter what has been said about the recent rapprochement between us, we are still divided by the same chasm which they cannot cross except by complete negation of their false teaching and acceptance of the Orthodox teaching. The heat of ancient ecclesiastical debates has long since worn off. Moreover, the Copts are certainly closer to us than, say, the Catholics, in such aspects as fasting and other ascetic fundamentals. This was pointed out by the Holiest Metropolitan Anthony and his faithful disciple and adherent, His Eminence John. However, as long as their principal dogma persists, they will stay outside our domain. Didn't the very fact that they were allowed to worship in an Orthodox cathedral signify a form of approval of their ritual? If some graceless Samosvyats or simply impostors wished to worship in an Orthodox church, wouldn't they be turned down? But not the Copts; these were allowed to serve as priests, like our own Orthodox clerics. Your Eminence, do you remember Rule 45 of the Holy Apostles? It is true that we administer our divine services at Our Lord's Grave and at Our Lady's, and that the Copts and the Catholics do so, too, but can we put our routine sermons on an equal footing with the things that take place in the center of World Christianity? All things therein executed are anything but routine, and are inconceivable elsewhere. Moreover, if those sacred places were in our hands, no Copts or Catholics would be allowed to serve there. Meanwhile, by God's will, or through His negligence, we are no masters there. You advised, Your Eminence, that the lower church had not been sanctified. To this I will reply that when I was in that church, prayed there, and received communion at the holy altar, the priest who was serving at that time from an appropriate place was praying for this temple and those who enter it with faith, veneration and awe of God... Do these words mean nothing? Our prayer books contain prayers for reopening a temple after it has been defiled by heretics. These prayers are meant to purify from heretical filth a temple that was forcefully occupied by heretics. Before resuming Orthodox services in that temple, these prayers should have been read there. What can I say in this case? The temple was never forcefully occupied; its Orthodox clergy willfully allowed heretics to say their heretical prayers in it. References are made to His Eminence John... I have only one thing to add to what has been said about him above. Two days ago, His Eminence John was the subject of a conversation I had with a person His Eminence had known as far back as Yugoslavia. When the war struck in the Forties, followed by post-war chaos, this man had to travel the world extensively to survive. When he met His Eminence again several years later, he proceeded to tell him about his vicissitudes. One of the things he said was: For three years, I had to live in a place without an Orthodox temple, so I went to the Copts. What? You went to a Coptic church? asked His Eminence John. Intimidated (so he says) by the strict tone of His Eminence's voice, the man replied: Yes, I did, but I never attended any of their liturgies. Did you attend their all-night services? Yes, I did, Your Eminence. Have you repented this? No, I haven't, but the thing is I never prayed during their all-night services; I only attended them. Here's what you must do: next time you go to confession, make sure you repent of having attended a heretical service, concluded His Eminence John. As for violations of the canons which you, Your Eminence, are lamenting, you are right; the canons really are violated these days. However, I don't know if this regrettable fact may be used as a defensive argument. Wouldn't it sound very much like that story about a thief charged with thievery and unable to prove his innocence who tells the court in justification of his crime that all his neighbors also steal? This defense tactic didn't do much for the poor fellow. Your Eminence, you wrote to me about economia. I do not doubt for a second that you were motivated by your pastoral desire to render charitable assistance to victims of a heresy denounced by the Universal Council. What I do doubt though is that the principle of economia can go quite that far. You were right in remarking: maybe I shouldn't have let them do that either. When it comes to saving souls from delusion, the Fathers accept and approve of economia. However, no matter how and in what form economia is applied, it must not deviate from its essential postulate whereby it must always be made clear to heretics that Christian Truth is something that only Orthodoxy can give them. Heretics know not the Truth, or else their Truth is mutilated and distorted. They may not partake of the Truth except through full rejection of their heresy and full acceptance of Orthodoxy, including its dogmas, its moral commandments, its divine rituals, canons, rules, etc. Your Holy Eminence, in writing this, it is not my intention to bother you or argue with you out of my obstinacy. Wishing to be frank with you as a hierarch acting in good faith, I have to tell you that I consider this incident to be incomparably more dangerous than the once-sensational case of the impostor, the US $138,000 case, the Serb issue, and all the rest of them. Those cases were all due to someone's negligence, someone's errors, or discord of an ecclesiastical-political nature (the Serb issue), but no one could accuse us of stepping back from Orthodoxy; our faith and the dogmas remained inviolate. Look how many souls joined us after those events: they sought the Truth and they found it in our Church. What next? Word of the heretical services conducted at the Holy Trinity Cloister will travel fast. Every day fearfully I await questions from, say, the Old Calendarists or the Greeks, such as: is it true that heretics served at Jordanville? What shall I tell them? I cannot deny it, neither can I lie (lies would only exacerbate the situation; what if we lied and later the truth would come out). Shall I cite the principle of economia? They would probably note that the history of the Church has not known such economia that meets heretics halfway in their heretical commandments and rites. What will happen if our new children turn away from us? It gives me no joy to hear what believers say they had heard from resident monks of Jordanville: Ecumenism is thriving here: heretics administer their services in out church; the Catholics receive Holy Communion without having to join our Church. (Your Eminence, whence all these rumors? What stands behind such utterings, which I have heard more than once before?) If we are living in an era when the poisonous filth of ecumenism is spreading around, is it not our duty to subordinate the principle of economia to the principle of meticulous and very special prudence in dogmatic matters so as not to lead these children into temptation by opening our arms too wide to the heterodox and the non-Orthodox? Forgive me this unpleasant letter, Your Holy Eminence. Please pray for me.